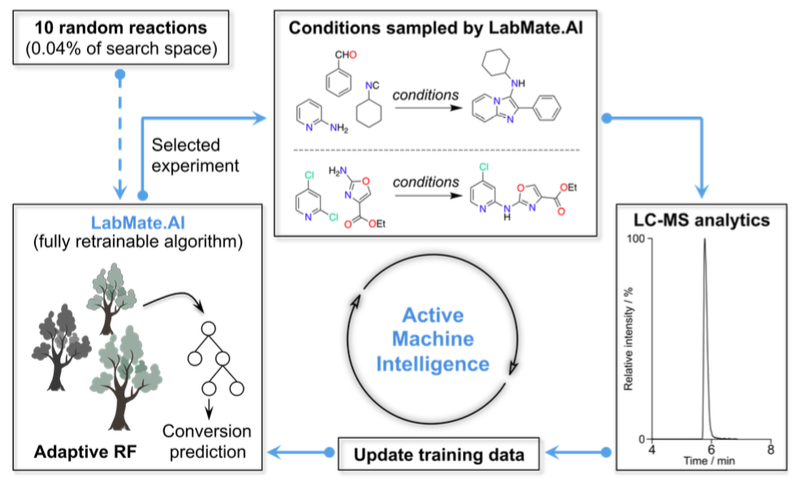 This paper is probably on the edge of what most people would call computational chemistry in the sense that is doesn't deal with structure-based predictions. The paper uses a random forest algorithm to optimise reaction conditions. What is especially interesting is the small amount of data needed to train the model compared to other machine learning algorithms. The method starts with only 10 randomly chosen reaction conditions as input and goes on to find an optimum set of conditions in only 20 additional steps. This approach is tested against expert synthetic chemists and found to be just as good or better. It is possible that this method could be adapted to molecular design (e.g. choosing the best combination of ligands) of properties that are expensive to compute or costly to measure experimentally.